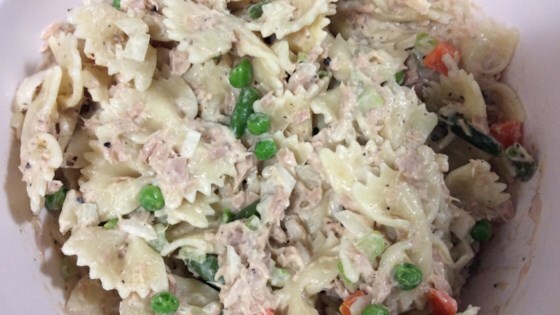 "Tuna gets jazzed up with jalepenos and a tangy lemon mayonnaise in this fun summer pasta salad. Serve over a bed of fresh iceburg lettuce. Use more or less jalapenos to suit your taste." Bring a large pot of lightly salted water to a boil. Add pasta shells and cook for 8 to 10 minutes or until al dente. Rinse under cold water until cool. In a large bowl, gently mix the cooled pasta, tuna, jalapeno peppers, onion, and celery. In a separate bowl, mix the mayonnaise, sour cream, lemon zest, mustard, and lemon juice. Stir the dressing mixture into the pasta salad to evenly coat. Season with salt and pepper, and chill until ready to serve. Way to spicy and i LOVE spicy things. The lemon tang didn't seem to fit. I don't know... not the greatest. No one liked it. Great Recipe! Very quick! Great zest to it -- a nice change for a tuna dish! Thanks!! This is so, so, so good! Straight, easy and great tasting as it is. We all LOVED it. Looking forward to pimping it up with some of the suggestions, next time around. Thanks WebsByMegan! This makes a delicious lunch. I used white onion in place of the red and left the celery out. I will make this for lunch often. This was awesome! Made it exactly like the recipe stated. Husband loved it. Light and refreshing.